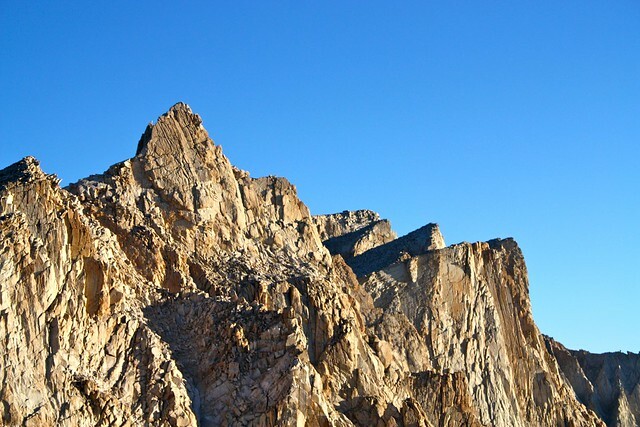 At an elevation of 14,501 feet, Mount Whitney is the tallest mountain in California AND the tallest peak in the Lower 48. 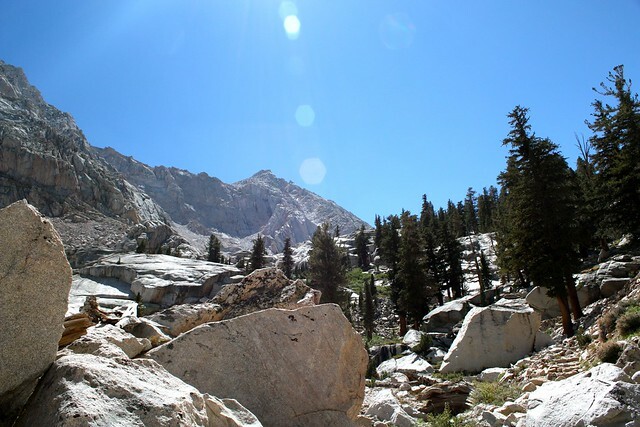 Beyond the physical superlatives, hiking the Mount Whitney Trail is a beautiful experience in and of itself, and it’s very do-able for Southern Californians. It’s only a few hour drive to get to the trailhead, and you don’t need any technical expertise if you tackle the main trail during the summer months. However, those willing to give this mountain a significant amount of planning, research, and effort will be greatly rewarded – whether or not they summit. Hoo boy is there a lot of red tape for this trail. 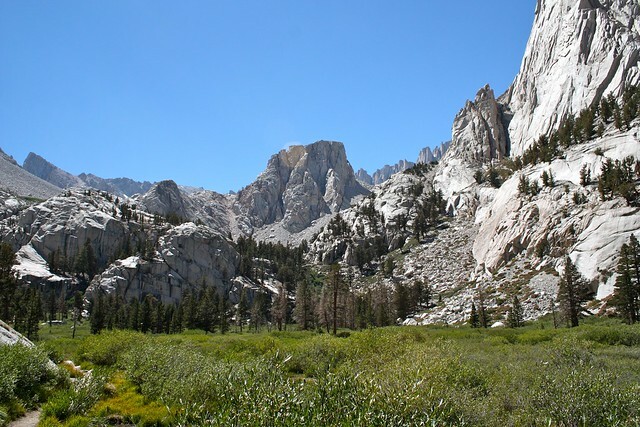 Late January / Early February usually marks the beginning of “Permit Season,” which is when the US Forest Service begins accepting applications to enter the lottery for Wilderness Permits for the Mount Whitney Zone. If you are hiking this trail between May 1st and November 1st, you’ll need to get one of these permits. 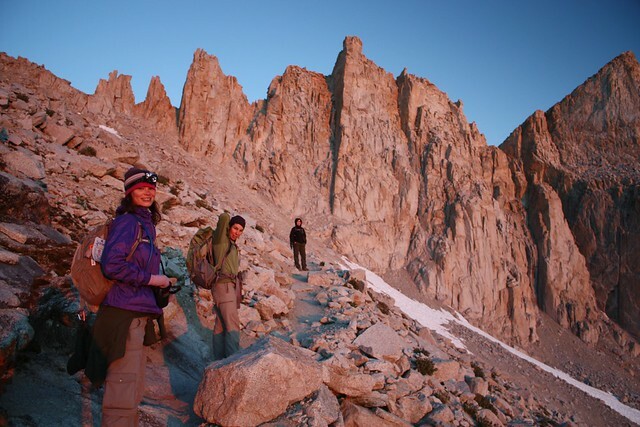 You will have to get your group together and pick several potential days you’d like to try to hike Mount Whitney – August and September are usually the best times in terms of weather, and weekends in those months book up very quickly. If you can manage time away from whatever you do to pay rent, I highly recommend asking for weekdays on your permit application as they tend to be less popular, giving you a better chance at snagging a permit. 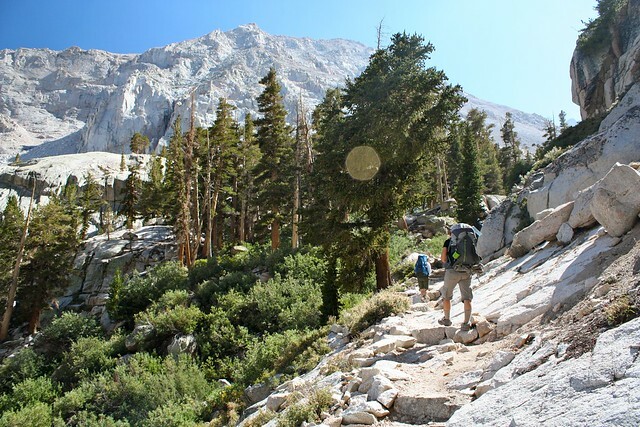 As of 2010, only 195 hikers are allowed on the trail on any given day during this season – 60 backpackers, 100 day-hikers, and 25 hikers coming in from other routes or ending their long-distance treks on the John Muir Trail. After you’ve secured your permit, you’ve got to pick it up at the Eastern Sierra Inter-Agency Visitor Center, 2 miles south of Lone Pine. If you haven’t snagged a permit, this is also where you’ll have to go in the morning to be entered into their day-of lottery (in case anyone cancels or doesn’t show up to pick up their paperwork). 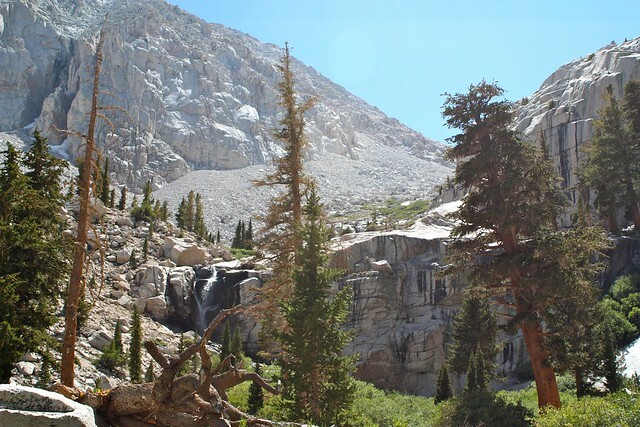 For more information, visit this site for the Inyo National Forest. The 2017 Whitney Lottery Results report on the Forest Service web site may also help you avoid the most popularly requested weekends and increase your chance of getting a successful permit. 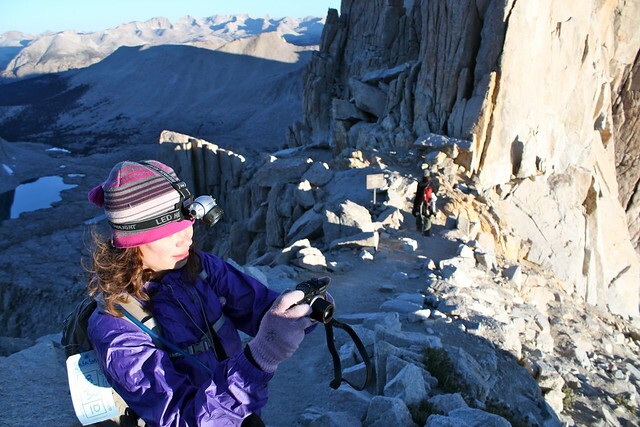 If you don’t manage to get a permit, it is still possible to hike Mount Whitney – either by participating in one of the day-of lotteries at the Visitor Center or by trying to find someone with a permit who’s looking to trade or fill a hole in their group. Be sure to check out the Whitney Portal Store’s excellent message board to see if anyone’s trying to trade. Oh, also – once you’re in the Whitney Zone, you will need to carry a WAG Bag with you at all times. You’ll have to pack out any solid human waste you might need to get rid of while you’re up there – but don’t worry. It’s not the most elegant system, but it’s really not as big of a deal as people make it out to be. See? I told you there was a lot of red tape! 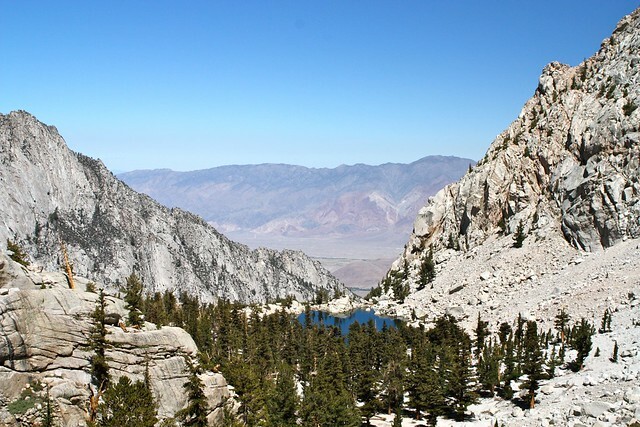 Good news, though – you don’t need an Adventure Pass to park in the Inyo National Forest. Mount Whitney. 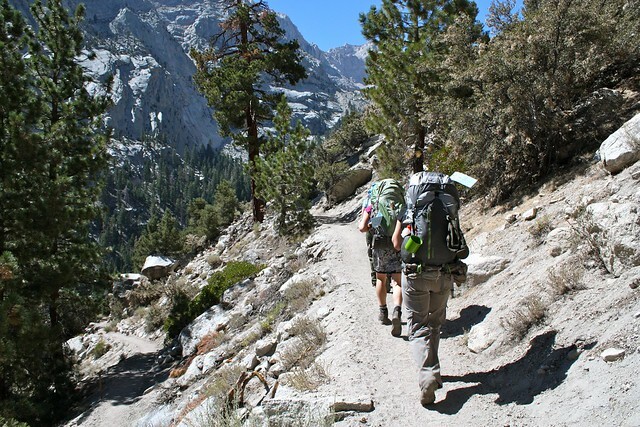 Spend enough time with hikers and eventually the topic comes up – it’s one of those things that hikers are just supposed to do, like Half-Dome or the JMT. It’s spoken of in reverent tones as a rite of passage, a badge of accomplishment, and a grueling, unappealing ordeal. In reality, it’s all of those things and none of them, too – but most of all it’s just a really fantastic trail and something that should definitely be on your to-do list. I’ve already waxed poetic about the experience of hiking this trail, so I won’t go into it too much here. After spending two days hiking and camping at 8,000 and 10,000 feet to get acclimated, my group and I began our Whitney Trek just south of the Whitney Portal Store full of hope and Pancake. While you’ll probably already be crazy excited to get started on this trail, it helps that you’ll most likely be accompanied by several people starting AND ending their treks at the trailhead. We saw an equal number of rosy-cheeked hikers ready to get moving and several summiteers passed out in the shade – It’s the full spectrum of the outdoor experience. When you’ve sufficiently steeled yourself for the journey ahead and hooked up your pack to the weigh station to see just how much you’re taking with you (40lbs for me, thanks to the unusually cold weather), walk through the wooden gate and start hiking. The trail near the Portal Store is soft with occasional sandy areas. This may bug you on the way up, but your knees will definitely appreciate it on the way back down. 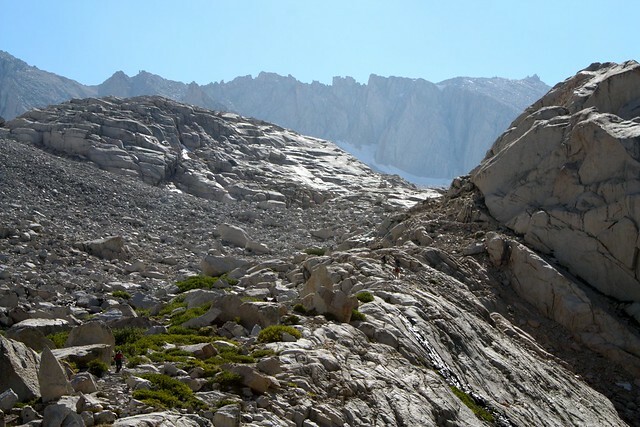 In the first half-mile, the trail provides some really outstanding views of Lone Pine and the vicinity, and if you’re paying attention you’ll notice something you’ve probably never read about in your Mount Whitney research (except for here, of course) – the Mount Whitney trail is gorgeous. After 0.5 miles, you’ll have to hop a small stream that runs across the trail. 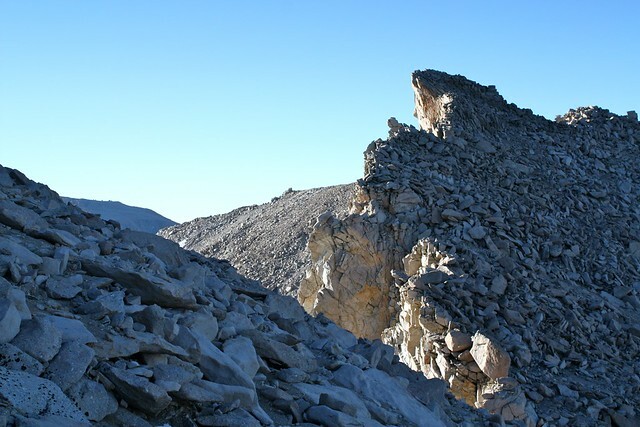 This is also the junction for the Mountaineer’s Route, but don’t worry about taking a wrong turn – it’s pretty clear which one is the main Mount Whitney Trail. In another 0.3 miles, you’ll reach the crossing of the North Fork of the Lone Pine Creek. Depending on the season you’re hiking in and the precipitation that year, it may be difficult to cross. The first crossing is a short boulder hop, followed quickly by a section with downed logs acting as a bridge. When we went, the first boulder hop was a bit tricky, but everyone stayed bone dry on the logs. 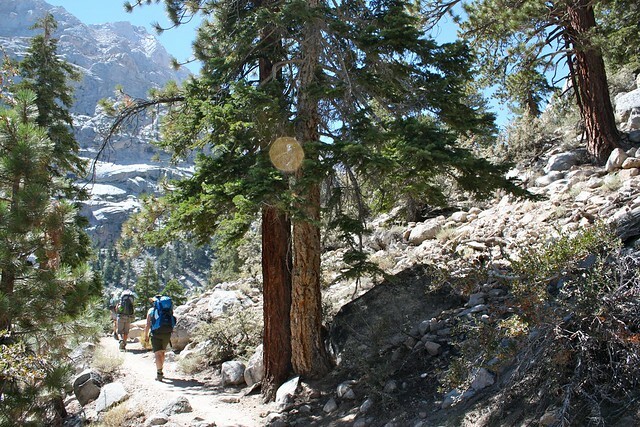 Continue on the trail until you reach the junction with the Lone Pine Lake Trail at 2.8 miles. 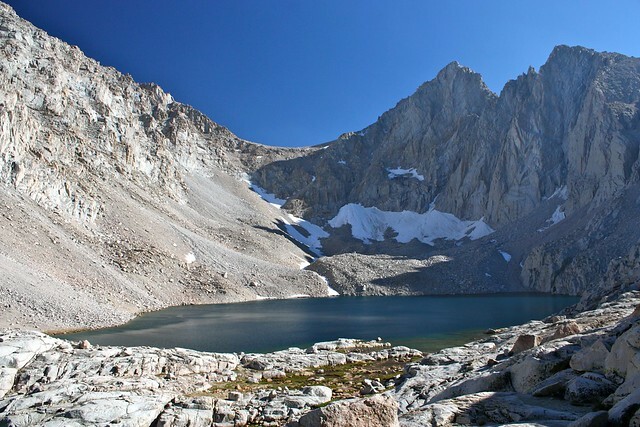 I know this early in the trail you’re probably thinking you’ve got to book it up to Trail Camp, but it’s well worth a short detour to see Lone Pine Lake if you’ve got the time. 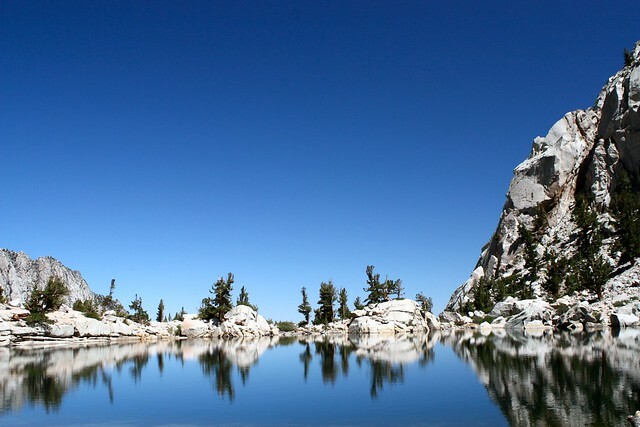 Ditch your pack at the junction and take a quick side trip 0.1 mile to the shores of Lone Pine Lake – a beautiful alpine lake with views deep into the Owens Valley. 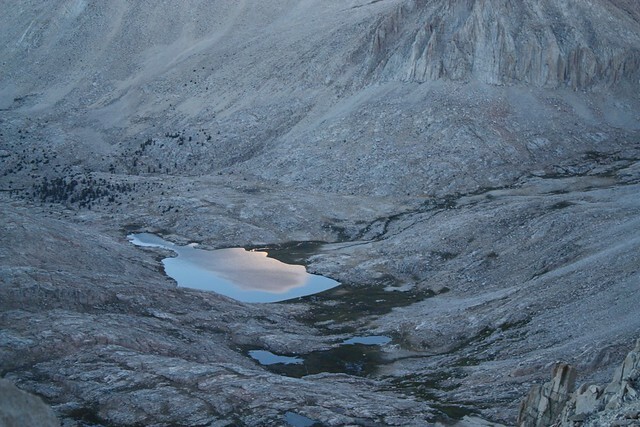 You are allowed to camp at Lone Pine Lake as long as you stay away from the actual shores. 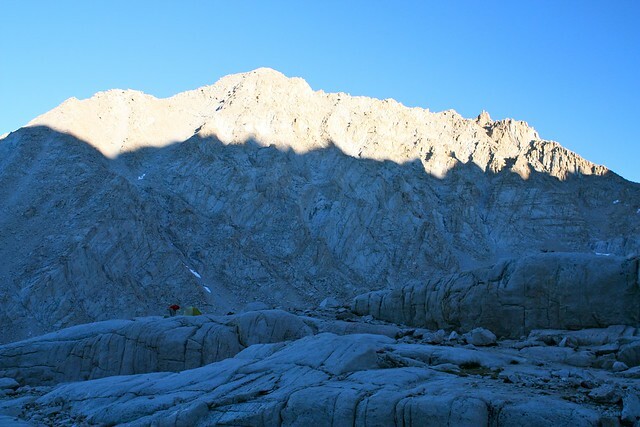 You need a Mount Whitney Overnight Permit to camp here – so this could be a good warm-up hike the day before you get going, or a good place to set up camp so you can get an early start on the Whitney Trail the next day and avoid crowding at the Portal, too. 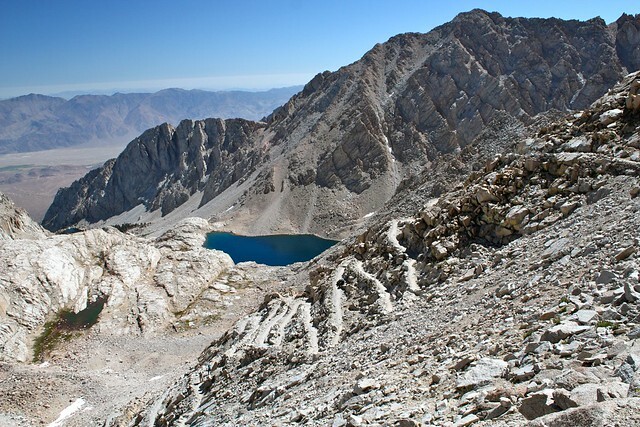 When you’re done soaking up the beauty of the lake, return to the Mount Whitney Trail and keep heading up. Just under 0.1 miles further, you’ll officially enter the Mount Whitney Zone – so make sure your permit is tied securely to your pack! Here, the trail begins to get a bit rockier, although you’ll still have the relatively soft patches of dirt to give your legs a bit of rest from the impact. There are a handful of switchbacks in this next stretch of trail, but nothing too dramatic or difficult. 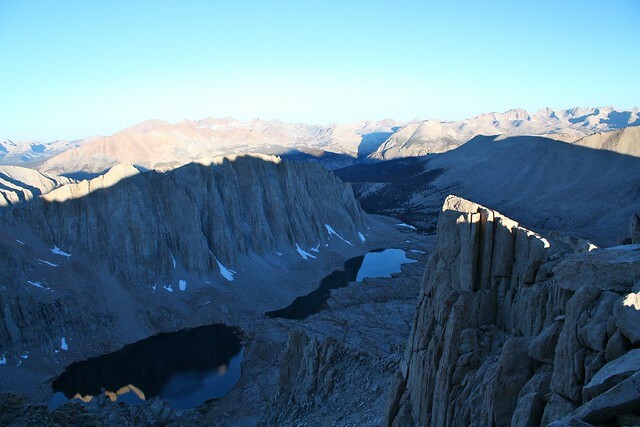 During this stretch, you will break 10,000 feet for the first time, and you’ll get a nice view of Lone Pine Lake, too! The trail makes a short descent before Bighorn Park comes into view. A narrow, lush meadow nestled between granite monoliths on either side, Bighorn Park was one area that everyone on our hiking team felt the need to take a moment to just gawk at. Low, broad streams flow near the trail as Wotan’s Throne looms above you. 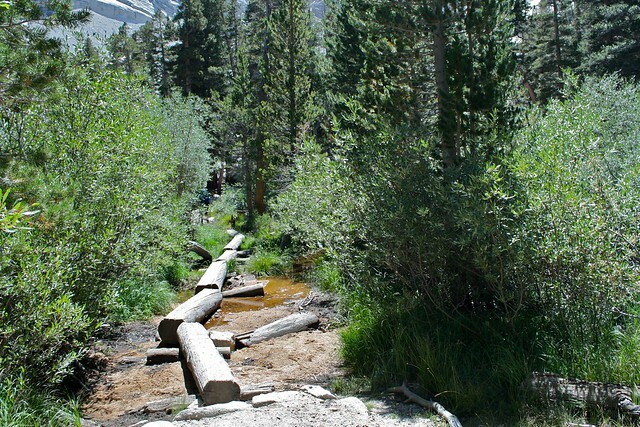 Continue along the trail, hopping over Lone Pine Creek again to enter Outpost Camp at 3.8 miles and 10,360 feet. 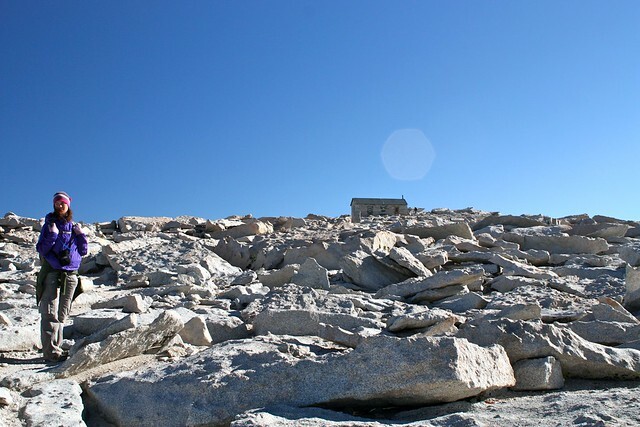 Outpost Camp is the first of the two main camps on the Mount Whitney Trail. There used to be a solar composting toilet at this camp, but it’s been removed. That, combined with the fact that it’s still quite a ways away from the summit means that not too many people stay at Outpost Camp anymore, but we all thought it would make a lovely camp site. There are babbling brooks on two sides of the camp, and you can hear a small waterfall from Lone Pine Creek just to the southwest of the camp itself. Unless you’re choosing to camp here, continue past the camp by hopping another short side creek. Here, you’ll climb up another series of short, tight switchbacks – but you’ll start to notice the dirt on the ground has almost completely given way to granite. Get used to it, because it’s pretty much that way for the rest of the trail. At 4.3 miles, you’ll pass Mirror Lake, on another set of tight switchbacks. Just above the lake’s shore (where you are not allowed to camp despite its definite draw) you can see the northern ridge of the Whitney formation, but not (I believe) the summit itself. 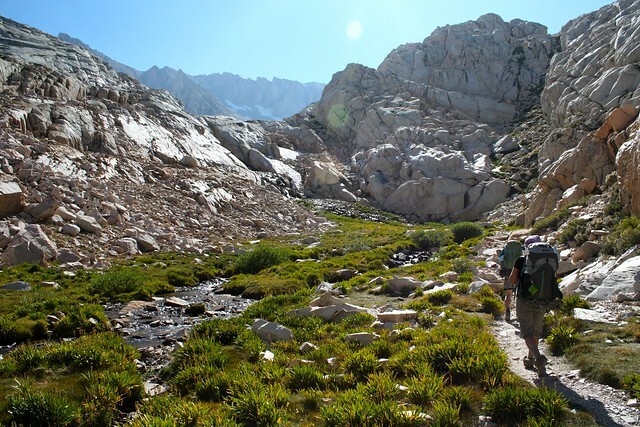 At 5.3 miles, the trail skirts the side of Lone Pine Creek at Trailside Meadow – a tiny sliver of an alpine meadow tucked inside the granite. It’s a good place to fill up on water if you need to, but no camping is allowed here. If you are looking to avoid the crowd at Trail Camp, though, keep your eyes peeled as you hike along the section of the trail. 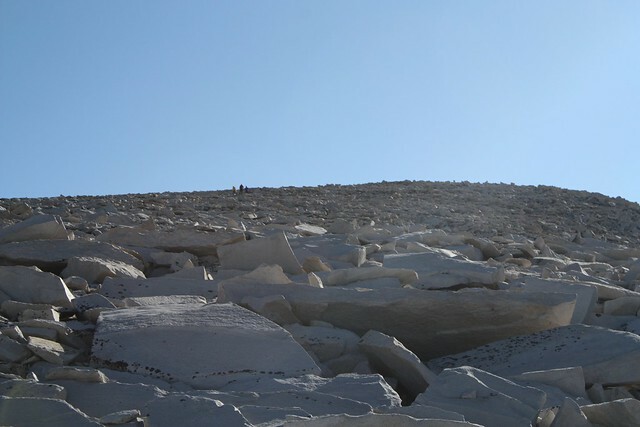 From the granite above Mirror Lake to Trail Camp itself, there are a few sandy, flat areas among the rocks to the side of the trail that people use as camp sites. From Trailside Meadow, it’s still a mile to Trail Camp. By this time, the trail may be starting to feel monotonous to you – especially because you really can’t see Trail Camp until you’re walking into it. Just keep on going, though – you’re very close. And you can check out the shores of Consultation Lake to keep your mind off the distance. 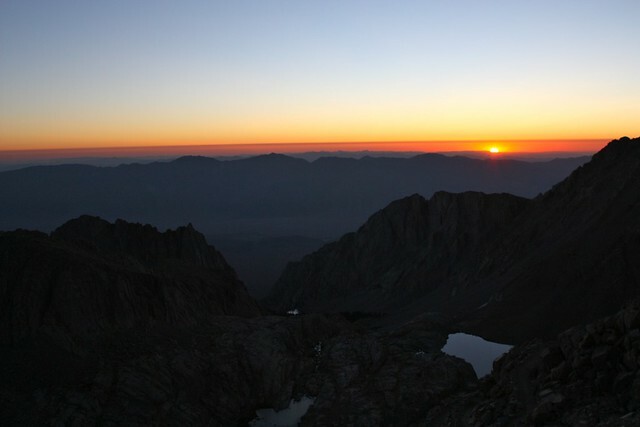 At 6.3 miles, you’ll enter Trail Camp (12,039 ft). 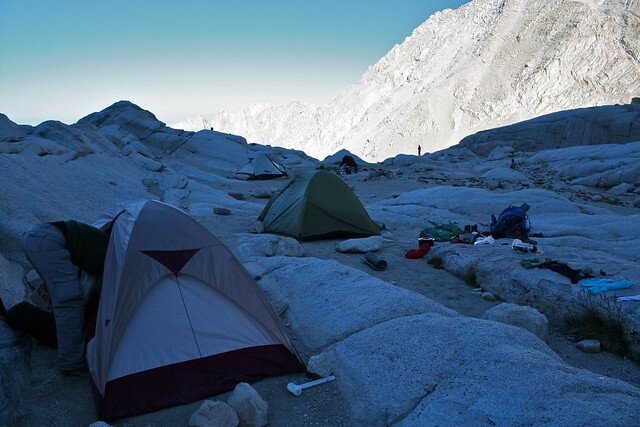 It’s a fairly large backcountry camp amid the glacially-carved granite in the shadow of Whitney. If you get there at a decent hour, you should be able to snag a good spot. There are plenty of small, sandy areas to pitch a tent, and plenty of rocks to tie your guylines to, too. We arrived in camp just as the sun was setting behind Whitney and didn’t have trouble claiming a good slice of ground, but those who strolled in after us did have to look for a while before settling down. Trail Camp can get crowded and does have some trash issues, sadly. I noticed a few abandoned WAG bags while I was there and some food packaging caught in some of the rocks. The lake right next to Trail Camp has much more algae than other bodies of water in the area, but if you’re looking for fresher water just follow the shore of the lake to the west until you get to the tributary stream – the flowing water is much clearer there, although you should still probably use a filter or purifying device since the area does get used by humans so often. You should also take care to store your food and other scented items in a bear canister – not to protect against bears, but marmots – little alpine relatives of squirrels who will be more than happy to chew through your tent or pack to get to something tasty. 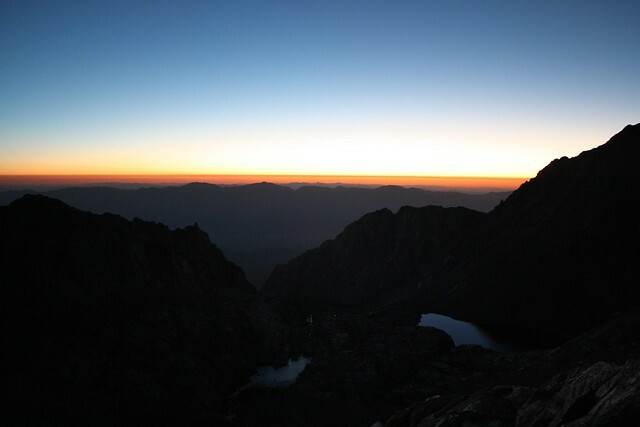 I understand most people have trouble sleeping at 12,000 feet, but we all slept like rocks. In fact, it was the most restful night of sleep I had on the entire trip, even with the anticipation of summiting the next morning. I guess hauling 40 pounds up a mountain will wear you out! Really, not that bad. There is one very short section with cables 1.4 miles in, but it’s mainly to help you navigate a section of the trail that tends to hold onto ice and snow longer than the rest. If you’re hiking this stretch in the morning like we did, you won’t be bored on the way up because you’ll be busy soaking in celestial beauty. As we started up the switchbacks, we could see the Milky Way above us in a sky so thick with constellations that we were able to hike without headlamps. As we gained elevation, we could see the sun peaking up above the Inyo Mountains to the east, slowly rising above Death Valley and bathing Mount Whitney in a stunning scarlet alpenglow. On a trip that was chock full of breathtaking moments of beauty, I think we all rated this stretch as our favorite. 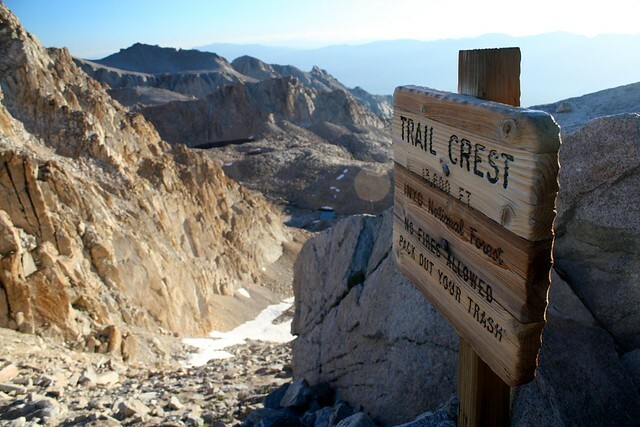 Eventually, you’ll reach Trail Crest, a narrow stretch of trail on the ridge that divides the Inyo National Forest from Sequoia National Park. It might look a little hairy here, but it’s no worse than the Devil’s Backbone – nothing to be worried about unless it’s crazy windy or iced over. If you’ve made it up to Trail Crest and you’re not exhausted or experiencing signs of Altitude Sickness, you’ve essentially done all the work to summit. From here, it’s only 2.5 miles and 845 feet of elevation gain to the summit – although it may be one of the most draining 2 and a half miles you’ve ever hiked. 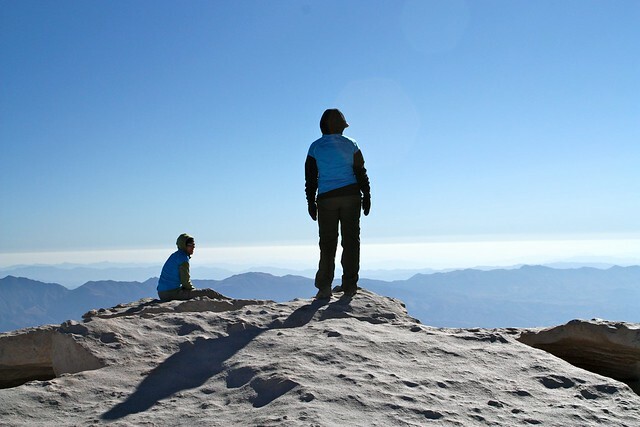 The views into the eastern edge of Sequoia are breathtaking. Huge glacier-carved valleys, mountain spires, alpine lakes and meadows and distant forests. It’s all quite stunning, and will make the journey to the summit easier to handle. After a slight (and slightly demoralizing) drop, the trail meets up with the John Muir Trail about half a mile from Trail Crest. This junction is signed and marked, but I have heard tales of hikers continuing on the JMT and missing the turn off for the Mount Whitney Trail, so just make sure you read the signs. If you’re in doubt, you should hang a right at the junction and start gaining elevation again. If you went straight and feel like you’re descending, you’ve missed the turn. It’s tough to get the sense of vertical drop into pictures of the windows, but it’s pretty much just straight down right below me there. The trail stays far enough away from the drops that you’ll still feel safe, but those of you with heights issues may not want to poke your head through the windows. It’s 1.7 miles from Mount Muir to the summit. 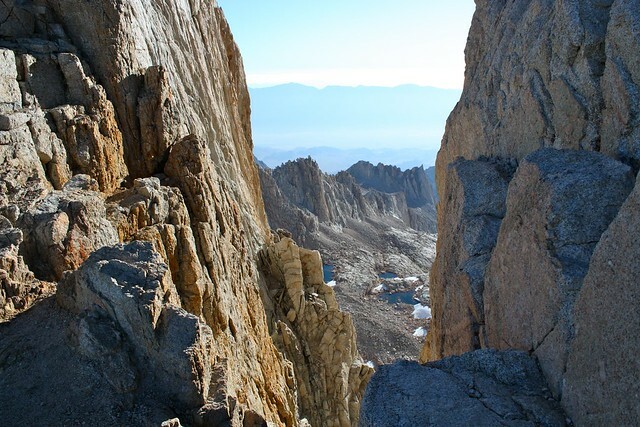 As the trail gradually gains elevation and passes the windows, you’ll come to the western slope of Mount Whitney itself. Here, there’s not much to look at, but if you’re lucky you’ll be able to see some hikers further above you on the trail. When you reach the summit marker, congratulate yourself – you are now the tallest thing in the contiguous United States! After you’ve soaked in the summit, return back the way you came. Oh, and congratulations! 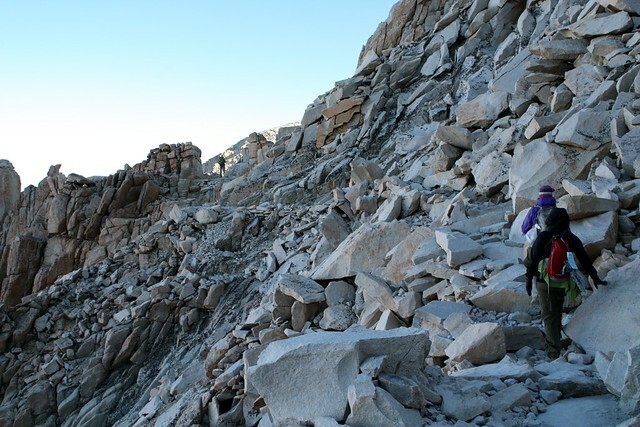 Mount Whitney is not a hike you just show up and do. You’ve got to plan and research, THEN hit the trail. an invaluable resource when trying to visualize and prepare for this hike. She does an excellent job of breaking down the hike into sections, goes over mountain safety and Altitude Sickness, and generally just offers all sorts of helpful information. If you’re thinking about doing Mount Whitney in the future, I highly recommend you pick up this book. As I mentioned earlier, the Mount Whitney Portal Store’s Message Board offers the most up to date information on weather and trail conditions from hikers themselves. This is a great place to find information on where to get water, learn tips from veteran Whitney hikers, and find out just how difficult it really is to finish a pancake from the Portal Store. 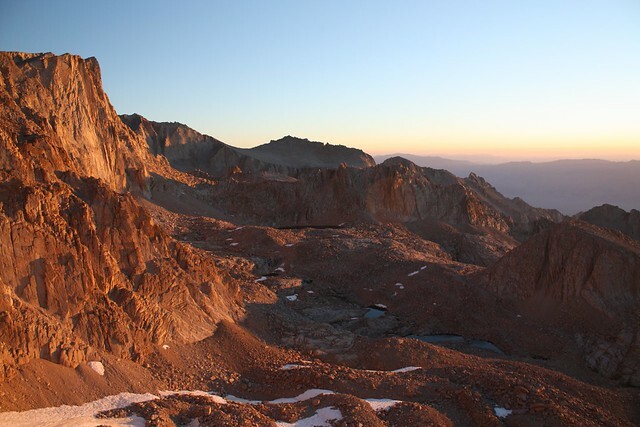 If you want to get a great idea of what the trail is like before ever setting foot on it, check out this post on another forum, featuring the entire Mount Whitney Trail on video. Don’t worry – it’s broken up into sections and sped up, so you won’t need two days to watch it. Here is a take on the trip from some of my teammates. If you should happen to be in the town of Lone Pine for breakfast, definitely hit up the Alabama Hills Cafe. Your body will thank you for eating something other than GORP. Excellent. This is one of the most popular hikes in California - if not the entire country - and the trail will be well-traveled and well-marked. On the main trail, there are really only three junctions along the entire route - but people have taken the wrong route before so be sure to pay attention to the signs! Whitney Portal Campground is the closest reservable site, although there are several walk-in campgrounds nearby as well. 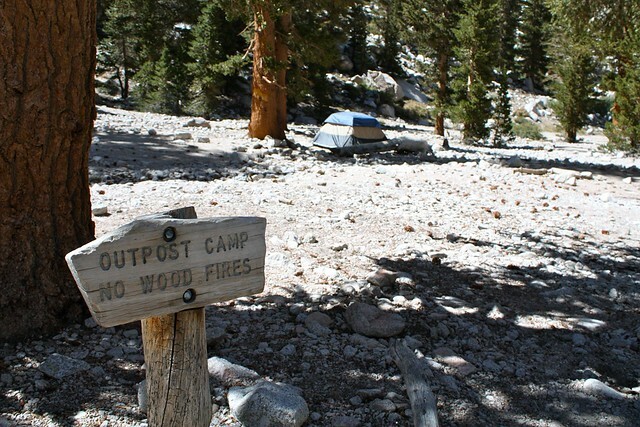 Camping on the Mount Whitney Trail itself is all first-come, first-served and requires the appropriate permits. From Los Angeles, travel north on the 101 or 5 to CA-14 in Santa Clarita. Take the 14 north, then continue north after it meets the US-395. 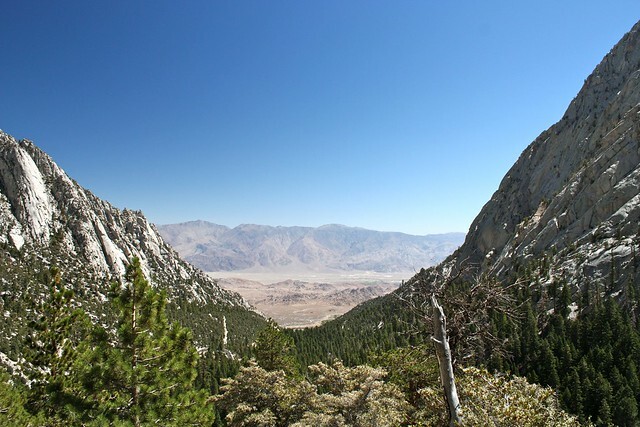 Continue past Owens Lake until you reach the town of Lone Pine. 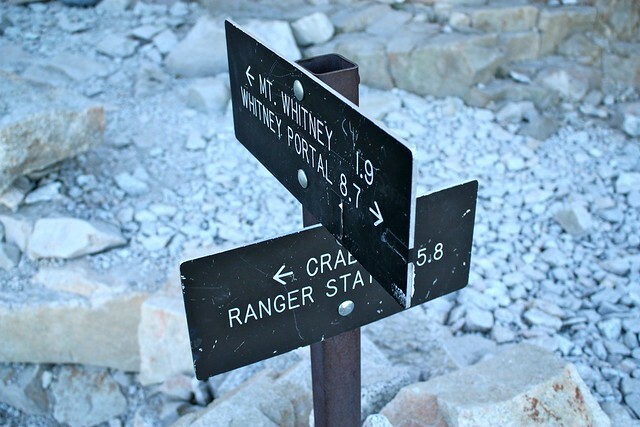 Take a left onto Whitney Portal Road and follow it until it ends at the Whitney Portal Store and trailhead. In March you can depend on this trail having a lot of ice and snow unless we're in an exceptional drought year. In those conditions, this is a technical trail and requires additional gear and expertise. Would you happen to know how is the trail around March? Is there still snow? If so, how much of it? What are the weather conditions around that time? I am looking to hike this for my 25th birthday which is in March. I've hiked other peaks...so I am not worried about the altitude or miles (of course, I'll do more research on this one), but what are the weather conditions like? The snow intimates me a little. Thank you!! Thanks for the update - we'll note the changes in the guide. 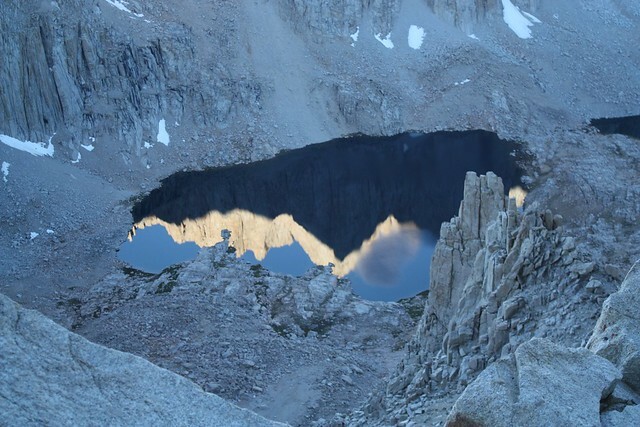 I just talked to the Rangers station about getting a backcountry permit to camp at Lone Pine Lake the night before my Mount Whitney Permit is active. 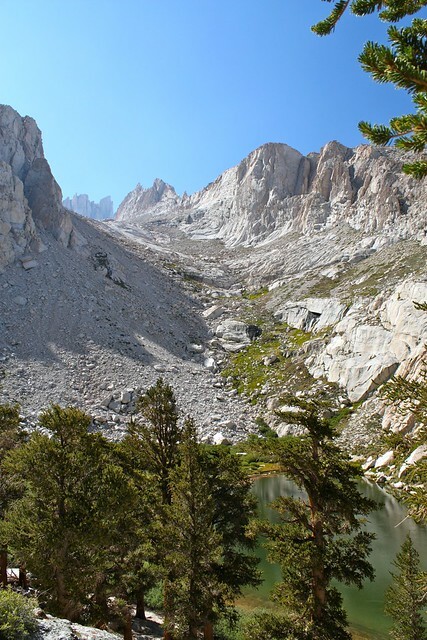 They said for Lone Pine Lake I need a Mount Whitney overnight permit, not a separate backcountry permit. i was one hiker who continued on down the MIT. Looking upward and noticing hikers on the Whitney Trail i was thankfully able to overcome what could have been a serious mistake by taking a direct line shortcut to the Whitney Trail. I actually attribute my error to information overload. Just found out that I will be hiking Mt Whitney on JULY 4th, 2018....it was my first time applying for a permit and my number one preferred date was chosen. Saying that I am excited is an understatement....I am a well versed hiker but this will be my toughest test yet. I'm about 3 months out and plan on being totally prepared both mentally and physically. I will report back when I get back down!! We climb Mt. Whitney October 1-2, 2017; Left Whitney Portal with 47 lbs of gear and food (+ my sister's day pack) at 4am to hike up to Consultation Lake to acclimatized for the rest of the day; set-up camp.The goal was to summit first day to see the sunset (we opted to rest instead. Left Consultation Lake at 3am towards the summit to witness amazing beautiful sunrise at the 2 windows; due to freezing temperatures (my water tubing froze and i could not sip from it.) Take a small Nalgene wide mouth with you as a reserve just in case. We have to keep on moving (no time for take pictures due to cold temperature + windchill factor.) Witnessing the sunrise on the 2 windows was so amazing that I could relive in my memory. Arrive at the summit 5 hours later, we were so cold and the frustrating part of it is that the ink on any of the pen frose and it could not write.I ask my hiking friends what day it is today and and they answered Monday, October 2....I told them "today is my 54th b-day." We quickly celebrated with PB and J sandwich and Bevita, hydrate, attempted to take a quick picture and were off to a warmer elevation. So, the answer to your question, lots of leg work, stairclimber would help and a lot of some high altitude hike would help...I am from SoCal and I do a lot of mountain hikes around Otay Mountains with my 2 boxers; next year i will work on bringing them with me. Good luck and keep on hiking. Do you have any tips for climbing Mt. Whitney in early October? What time did you summit?